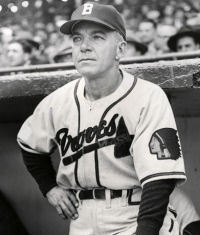 Billy Southworth spent 13 seasons as an outfielder and 13 as a National League manager. A popular figure with players, Southworth skippered the St. Louis Cardinals for seven seasons, averaging 101 wins a season between 1941 and 1945. He won three pennants with the Redbirds, along with World Series titles in 1942 and 1944. 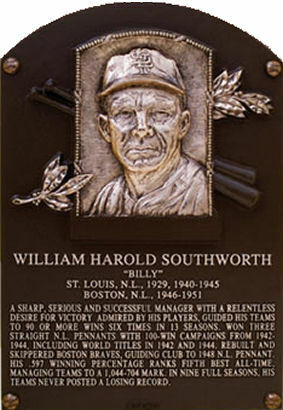 During his six-year stint as manager of the Boston Braves, Southworth brought the perennial league doormats their first pennant in 34 years during the 1948 season. Southworth finished with a 1,064-729 record, posting one of the best winning percentages (.593) of all time.